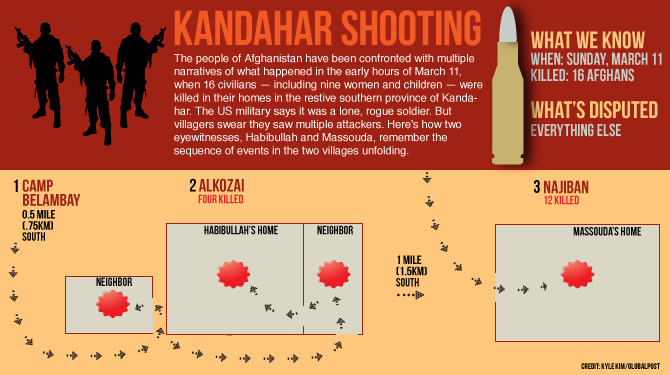 KANDAHAR, Afghanistan — Conflicting reports from eyewitnesses, U.S. officials and local leaders show, if anything, how little is known for certain about what happened in the early morning hours of March 11, when Staff Sgt. Robert Bales allegedly massacred 16 Afghan civilians, including nine women and children. About the only facts the U.S. military and local Afghans agree on is the number of people killed during the shooting — which took place in two remote villages in Kandahar Province, a half-mile from a U.S. military outpost — and that the killings occurred sometime in the early morning hours. While Sgt. Bales is in custody in the United States for the shooting, locals swear that multiple soldiers participated and that they communicated via walkie-talkies, indicating the attack might have been a more organized operation. Such accounts, however, stand in stark contrast to the story being told by U.S. officials of a lone U.S. soldier, Bales, who snapped under the pressures of multiple deployments. A spokesman for the International Security Assistance Force, or ISAF, the coalition of U.S. and NATO troops operating in Afghanistan, said the investigations were still ongoing. “ISAF is looking into all the witnesses accounts who are deemed credible and we will investigate that,” Lt. Brian Badura said. Credible is the key word. Most of the “witnesses” so far interviewed are from the villages, or are family or friends of the victims. But very few actually saw the shooting unfold. Afghan President Hamid Karzai, who summoned several villagers to Kabul to get their side of the story, has ardently supported their claims. GlobalPost, however, interviewed the same people in Kandahar before they flew to meet Karzai, and found that either they didn’t see the shooting or that they couldn’t recall key details. Habibullah, a 28-year-old farmer who saw parts of the massacre unfold, was one of those who met Karzai. He told GlobalPost he saw several soldiers in his compound when his father was shot. But he also admits he can’t remember everything that happened. “My mind is too confused,” he said. Habibullah tried his best to describe the shooting for GlobalPost. He drew a map of the three houses in his village, Alkozai, where four people were killed. His house was in the middle. He said his wife woke him up early in the morning — he can’t recall the exact time — shouting that American soldiers were at the house next door. Habibullah told her not to worry. “This is a night raid,” he remembered telling her. But a few moments later residents from neighboring houses began fleeing to Habibullah’s, telling everyone to hide. The attacker — or attackers — soon followed, he said. Karzai also spoke to Mullah Baran. Baran’s brother was killed in the shooting spree, but he didn’t see the shooting happen. Baran said he told Karzai what his sister-in-law, who was at the scene, had told him. When GlobalPost asked Baran to speak directly with his sister-in-law, he initially refused. Eventually Baran relented, allowing GlobalPost to interview her by phone. Massouma said the soldier shouted “walkie-talkie, walkie-talkie.” The rules of engagement in hostile areas in Afghanistan permit U.S. soldiers to shoot Afghans holding walkie-talkies because they could be Taliban spotters. After the soldier with the walkie-talkie killed her husband, she said he lingered in the doorway of her home. “While he stood there, I secretly looked through the curtains and saw at least 20 Americans, with heavy weapons, searching all the rooms in our compound, as well as my bathroom,” she said. After they completed their search, the men left, Massouma said. She said that all seven of her children saw the attackers, but she refused to let GlobalPost speak with them. An Afghan journalist who went to Massouma’s home in the days after the shooting and spoke with one of her sons, aged seven, said the boy told him he looked through the curtains and saw a number of soldiers — although he couldn’t say how many. Based on hard-to-verify testimonies like these, local and national politicians in Afghanistan claim publicly to have definitive accounts of the massacre — making public statements that have further increased tensions among Afghan civilians, the Taliban and the Americans. Massoud Akhundzada, a member of a prominent religious family in Kandahar who lost relatives in the massacre, said he is angry about the attack. But he has appealed for calm, warning against a rush to judgment by those who claim to know what happened. Local Afghan journalists are among those searching for the truth. While several local reporters have visited the scene, they said actual eyewitnesses have been difficult to find, because most villagers are reluctant to talk and authorities have prevented journalists from visiting wounded survivors. U.S. officials in Afghanistan gave several Afghan journalists permission last week to visit survivors of the massacre, who are being treated at the hospital at Kandahar Airfield, a major military base in southern Afghanistan. But when the journalists arrived they ISAF officials only allowed them to take a few photographs and then asked them to leave.